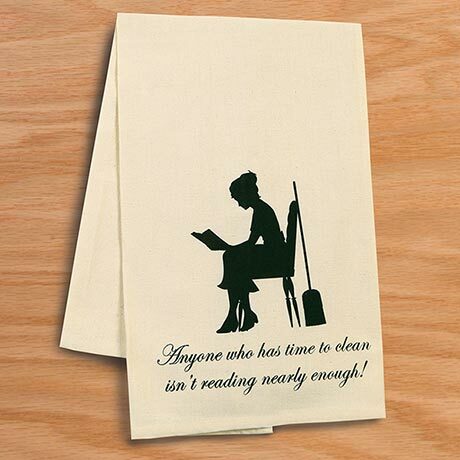 "Anyone who has time to clean isn't reading nearly enough!" Hear, hear! At Bas Bleu, we enthusiastically encourage letting the dishes pile up, putting off folding the laundry, and procrastinating on dusting...all in favor of getting lost in a good book! If you feel the same way, you'll want to display our cheeky "No Time to Clean" Tea Towel. With a pretty vintage-style silhouette illustration to accompany the funny quote, the cream-colored, 100%-cotton 20"x28" towel makes an amusing little gift for anyone whose top priority is finishing that last chapter!